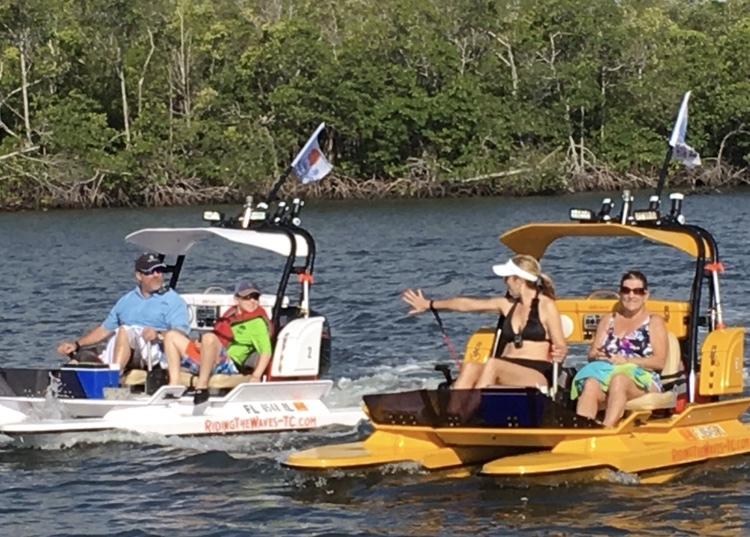 How would you like to combine two awesome activities in Stuart into one? Riding the waves Treasure Coast is excited to announce we are now partnering up with the Oceanographic Society in Stuart for a whole new adventure. Join us on Mon-Fridays at either 9:00 am or 12:00 pm for 3 hour guided Eco tour. We will start out by driving the boats from manatee pocket for an hour Guided Eco Tour north to the Oceanographic Center, we sill spend Approximately 1 hour in the Center, walking through the nature trail, Feeding the Stingrays, walk through the Inside educational center and gift store. We will then return to our boats and enjoy an hour guided Eco tour back to the docks. Bring Shirt and Shoes!! Experience the beauty of Florida’s East Coast from the water with Riding The Waves-Treasure Coast. During our guided boat tours, you’ll learn all about our local ecosystem and natural environment from a certified Florida naturalist as you cruise along with a friend in your own private catamaran. It’s the perfect way to spend a day on the waves and explore this beautiful part of the world.